AG Chat Service | AvantGuard Monitoring - Be In Good Company. 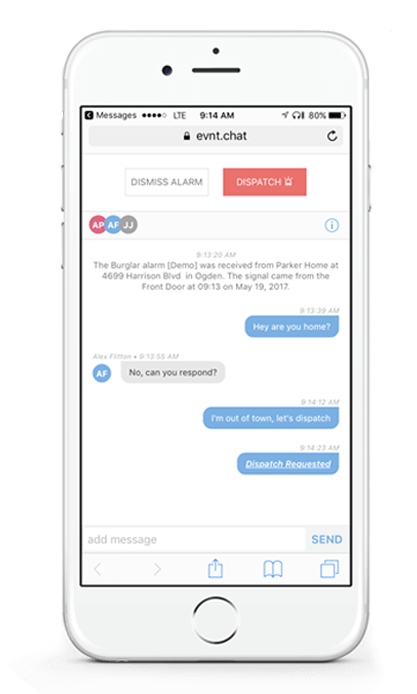 The next big step to faster, smarter emergency management. And it's free. AG Chat is a secure, group-chat service that allows subscribers to participate in event management. Within a predetermined window of time, account members can decide if an event is a false alarm, talk with other members to share information and, if necessary, request dispatch to arrive on scene. AG Chat sets the new standard for wholesale alarm monitoring companies. Better team correlation provides opportunities for someone in the know to dismiss what they know to be a false alarm, even if they are the fourth contact down the list. Even when contacts don’t respond, a set time limit expires, the operator gets the signal and dispatch gets sent right away. Not everyone can take a call at any time. The SMS communication method reaches subscribers in a much more accessible way than a traditional phone call. Imagine every contact getting notified at the same time. One member of the group knows what's going on and can respond most appropriately. So much gets done in so little time. When all contacts have the opportunity to respond at the same time, the team can provide their unique insights into what’s going on. Even if a burglar happens to get a hold of someone’s cell phone, they still need to enter a verification passcode before dispatch is canceled. Imagine reducing false dispatches, improving response times up to 90%, and reaching out to every member on an account at the exact same time. AG Chat makes that happen.